The use of scissor- and guillotine-type clippers apply pressure and pinch the nail, which can be uncomfortable for pet toes and feet. The Dremel Pet Nail Grooming Kit allows you to quickly, easily and gently trim your pet's nails. Included in the grooming kit is the Dremel Pet Nail Grooming Guard attachment that features a 45-degree angle paw guide and a clear cap for easy viewing. The Pet Nail Grooming Guard features a hinged design for easy cleaning and assembly. 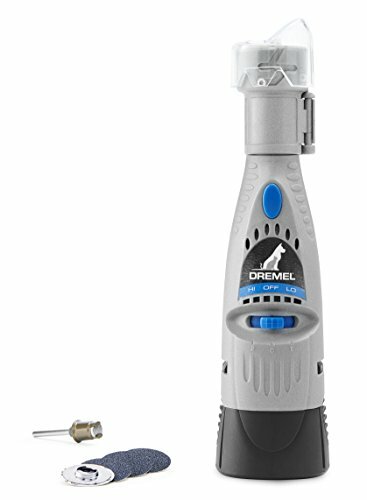 The guard can be used with other compatible Dremel rotary tools. With instructions and tips included in the kit, you'll be grooming pet nails in minutes. When your pet nail grooming duties are done, the model 7300-PGT is a compact, go-anywhere cordless tool with two speeds that comes in extremely handy in and around the house for light-duty projects, precision work and jobs requiring control.